Storms, sunken ships, pirates. Ibn Battuta’s journey to China was an eventful one. However, the art and inventiveness he saw in China made up for his troubles. The court captures the majesty and vibrancy of Imperial China. Spacious colonnaded halls decked with giant dragon medallions, white marble columns reminiscent of the gates of historic Chinese cities, a coffered ceiling with royal motifs symbolizing happiness and prosperity. 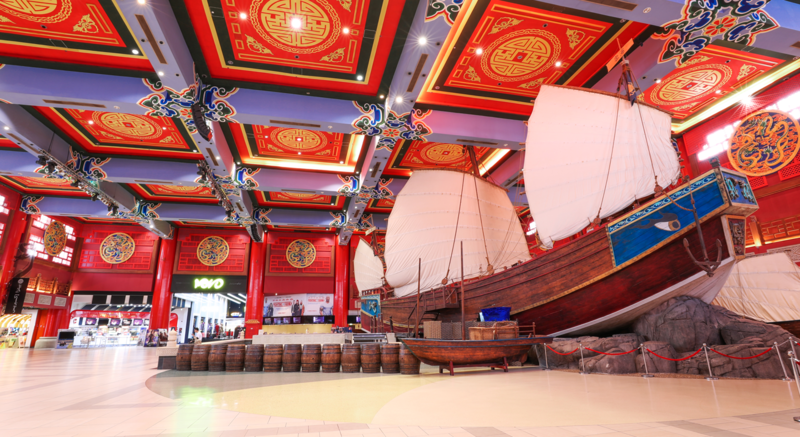 At the centre of it all is one of the most seaworthy vessels of its time – a Chinese Junk. It’s our homage to the great traveller and his remarkable adventure.